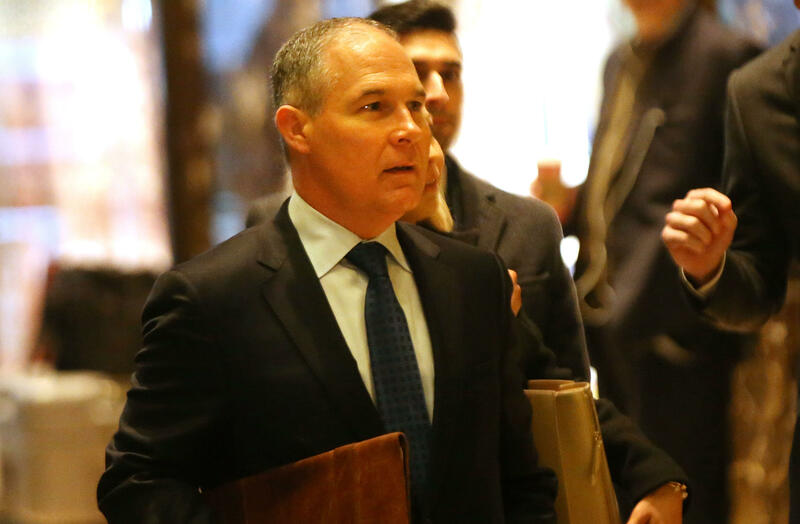 President Trump described Scott Pruitt, his embattled Environmental Protection Agency chief, as a "good man" on Thursday while declining to comment on recent press reports about the administrator's behavior. "I think he's done a fantastic job," Mr. Trump told reporters aboard Air Force One during his trip back from West Virginia. "I think he's done an incredible job. He's been very courageous. It hasn't been easy, but I think he's done a fantastic job." Pruitt has come under fire recently for renting a room from a prominent energy lobbyist, spending public funds to travel abroad, authorizing substantial pay raises for a pair of young aides without White House approval, and the behavior of his security detail. When asked about these reports, Mr. Trump replied that he would "have to look at them…I'll make that determination. But he's a good man, he's done a terrific job. But I'll take a look at it." Being called a "good man" by Mr. Trump is considered something of a bad omen in Washington, D.C. This is because president has a habit of using the phrase to describe staffers he is on the verge of firing. Rumors have circulated in Washington, D.C., that Pruitt would soon find himself out of a job soon. Earlier on Monday, White House deputy press secretary Hogan Gidley said that he could not "speak to the future of Scott Pruitt." But Mr. Trump said he still had confidence in Pruitt. Mr. Trump also denied that he had any knowledge about a $130,000 payment to the adult film actress Stormy Daniels, who alleges that she had a sexual encounter with the president years before he took office. Michael Cohen, Mr. Trump's longtime personal lawyer, facilitated the payment in exchange for Daniels signing a non-disclosure agreement. When asked why Cohen made the payment, Mr. Trump referred the questions to his lawyer. "You'll have to ask Michael Cohen," Mr. Trump said. "Michael is my attorney. You'll have to ask Michael."